James "Jim" Walter Allen, Jr. 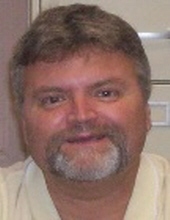 Celebrating the life of James "Jim" Walter Allen, Jr.
Obituary for James "Jim" Walter Allen, Jr.
James Walter "Jim" Allen, Jr., age 54, of Betsy Layne, Kentucky passed away Sunday, September 23, 2018 at his home. He was a Social Worker and was Case Manager at Mt. Comp.. He was a veteran of the United State Marine Corp.
Jim was born at Pikeville, Kentucky on December 28, 1963 the son of Madge Eplin Allen and the late James Walter Allen Sr. Along with his mother Madge Allen of Betsy Layne, Ky. he is survived by his wife, Bernadette Thacker Allen and one son, Jeremy Jewell of Frankfort, Kentucky and one daughter, Kasey Jewell of Ohio. He is also survived by one sister, Jamie Allen of Betsy Layne and one grandchild, Peyton Jewell of Pikeville, two nephews, Koty Newsome and Blake Newsome and two great-nieces, Ariella Newsome, and Kennedy Newsome and one great-nephew, Abel Newsome. To send flowers or a remembrance gift to the family of James "Jim" Walter Allen, Jr., please visit our Tribute Store. "Email Address" would like to share the life celebration of James "Jim" Walter Allen, Jr.. Click on the "link" to go to share a favorite memory or leave a condolence message for the family.